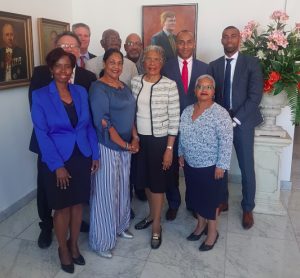 WILLEMSTAD - The Advisory Council maintains regular contact with the Governor of Curaçao H.E. Lucille George Wout in her capacity as Chairman of the Board. In that context, a meeting with the members of the Council took place in the Governor's Palace on Monday 3 September 2018. During this meeting, ideas were exchanged about matters of legislation and administration. The core task of the Advisory Council is to advise on matters of legislation and administration. By law, the government has to hear the Advisory Council about, among other things, draft national ordinances that it intends to offer to parliament and draft national decrees, containing general measures, which it intends to adopt. In addition, the Council also advises parliament on draft national regulations before they take them into consideration.